B) Print & emboss the doll 2 times on White cardstock (Once, for the face & the main shape & once for the apron bit.) To emboss it, I treated the paper with Matte Medium (Embossing note: this does change the way the paper takes Copic markers; it's quite different feel, but I like the digital embossing so much. C) Colour the face & hair & cut the doll & the apron bit out. I coloured her hair with these 3 Copic markers: E71Champagne, E44 Clay, & Warm Gray No-7 and her skin with E50 Eggshell, E00 Skin White, & Sugared almond pink RV02. A) Print one of the the Babushka Dolls (I chose Olga) onto vellum cardstock, emboss the wet inkjet printer ink with clear embossing powder & heat gun it gently to melt the powder. 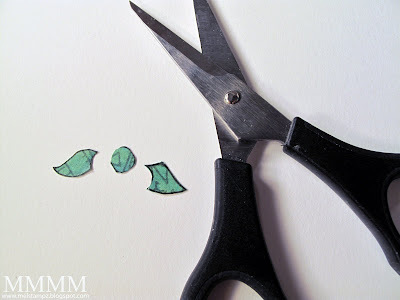 Adhere the embossed vellum to book paper & cut it out. A) Print the doll again to get the dotted patterned bottom--the dotted paper used here is from the GCD Party it Up collection. Like, vellum it lets you emboss from the printer because of the non-porous (metallic) finish. B) Print the scarf (on patterned paper & cut it out) Cheap Trick: Want your paper bits another colour? Copic markers will do the trick. I used two Copic colours to match the BasicGrey brad: YG23 New Leaf & Aqua BG15. Step 1) Colour the scallops on the dotted apron. Step 2) Print & colour a teeny version of the doll (as a wee baby to match Mommy.) Cut the baby image out. 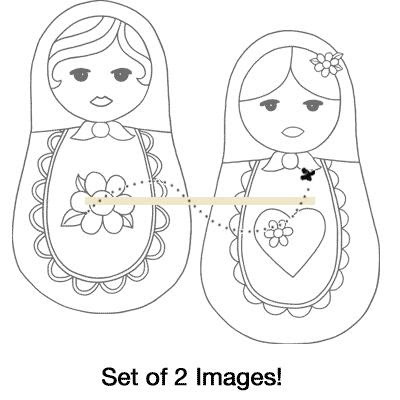 Step 4) Adhere baby in the Matrushka-Babushka Mommy's Tummy--so it will show from under the swinging apron. Step 5) Cut the scarf into three pieces & Adhere the two scarf ends to the vellum apron section. If you don't have a matching brad, you can make one by gluing the paper-pieced center knot of the scarf onto any brad you have. I just discarded it, since the BasicGrey brad matched. and you can see the itty bitty baby Babushka in her tummy! :-) What a lovely card! And what a lovely surprise hihihi :-) Thanks for sharing! Very very cute. Love the doll and the little one inside too. Lovely )))) Hi hi ) Better not to call her Babushka )))) Babushka means old woman in Russia. Who is waiting not for a children, but already has grandchildren. This girls with smth inside them are called MATRYOSHKA. Thank you for explaining how to make this card! I just love these dolls! You are so talented... it does stir up the creativity! Thank you for sharing your techniques. I think the paper is from My Minds Eye, Bloom and Grow. Quite apt don't you think?!!! Beautiful as always Mel. Hi! Wow! Excellent idea! Thank you. WOW!!!! This is stunning! Thank you so much for the tutorial! will try to create one as explained. Simply amazing as always!! I just love to see what you can come up with using a stamp! You're just so creative!! Love it. how's the packing coming? miss you! You never cease to amaze me. I think this is adorable. Thanks for all the instructions. I so appreciate you! How creative are you??!!! You're the best!! Hi Mel, this tutorial came just in time. 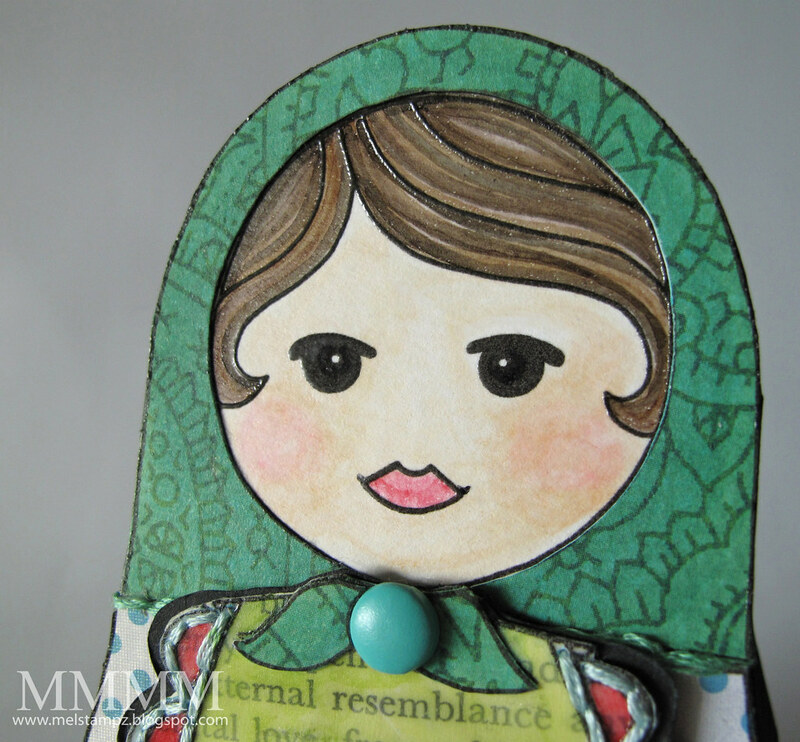 My mother has next wednesday her birthday and she adores babushka-dolls. So I have ordered immediately the digi stamps, so this weekend I will be busy!!!! This is INCREDIBLE! So inspiring! Thank you! This blog post will be advertised on CraftCrave in the Tutorials category today (look for timestamp: [26 Feb 01:00pm GMT]). Cute cute. You did these dolls justice! Melissa you've done it again. Just magnificent work. 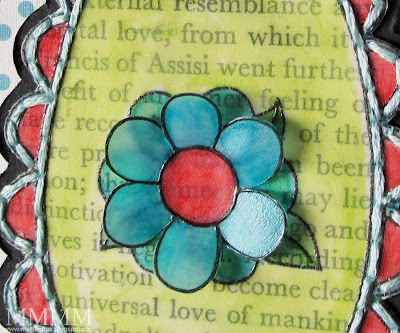 I really love the look of the book page behind the vellum, and the vellum flower is sooo pretty! I'm still chuckling over the fact your hubby might have had his heart skip a beat! Thank you so much for being Squigglefly's guest designer this month. Very cute card idea... I loved it! The colors are nice, too. Mel, what a great idea. Thanks for the inspiration! Adorable! How do come up with such clever ideas! You rock! Your doll card is terrific! So creative and fun! Thank you for the great tutorial too! Amazing!! I'm so impressed with your creative genius, this is such a clever card! I wandered over here from Jane's blog and I'm so glad I did. WOW! That is just adorable, and yes, perfect for letting one's honey know she's expecting! 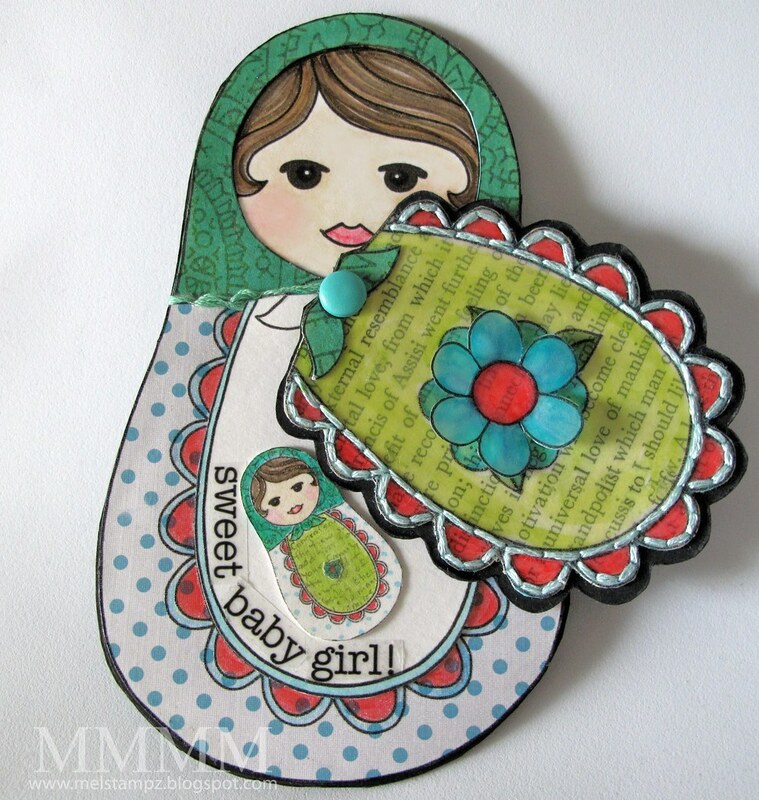 Oh my gosh, that baby babushka card is so darn cute! You come up with such awesome stuff. . .I always smile when I look at your cards and projects! Thank you for being such an inspiration, Mel!! Hi,Mel! I always read your tutorials to the end. 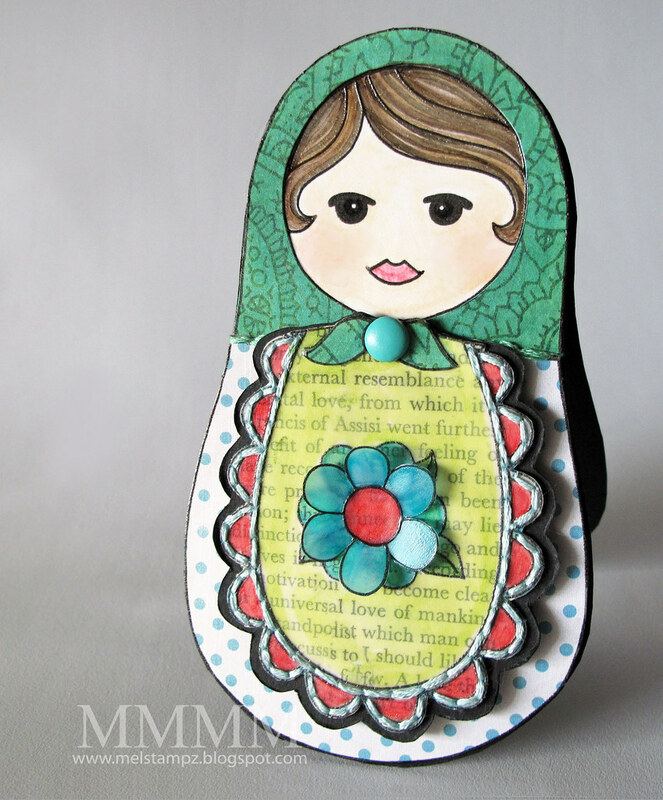 And it's a great idea to do a card MATRYOSHKA! I'm from Russia too, and soon we'll celebrate a woman's day...so i'll do a card based on your tutorial and spread the world about it and your blog one more time! This si ADORABLE Mel. Love it. Beautiful card and lovely tutorial. Thank you. I want to do these as invites for my little girls 1st Birthday. Can some please help me with the image? !